Behind Carmelo Anthony, the red-hot New York Knicks are riding their longest win streak since 1993-94. Now he can help the franchise accomplish something else it hasn't done since that season. Anthony's Knicks can clinch the club's first Atlantic Division title in 19 years Tuesday night when they try to extend their 12-game run and defeat the Washington Wizards for the 10th straight meeting at home. New York (50-26) is enjoying its longest win streak since taking 15 straight from March 1-April 2, 1994. That club won 57 games and a third straight division title. 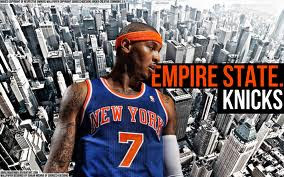 Now the Knicks can finally add another Atlantic crown with a victory over Washington (29-48) or a loss by Brooklyn to Philadelphia on Tuesday. "It's the end of the season, the last month. Everybody's fighting for spots. The playoffs are right around the corner,'' Anthony said. "This is the best basketball."